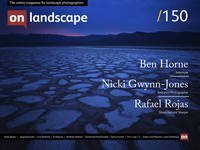 This issue we have a long awaited interview with Ben Horne, the YouTube'ing large format photographer from the US. We caught up with Ben just after his latest Zion trip. Tim Parkin (TP): Hi Ben and welcome. We have a bunch of questions in from our subscribers for you. So shall I start going through those? There’s some about large format, some about photography, the photographic world, and general ones about your adventures. The first one is from Roger Voller “I was wondering how does Ben keep his motivation up. All creatives have dips and I was wondering how Ben keeps his motivation so consistently high"
Ben Horne (BH): I think a lot has to do with the fact that my trips are all planned well in advance, and I have a lot of time to look forward to each trip. I typically go on three trips a year, so that allows several months of anticipation. I don’t do much photography here in San Diego because I really need to have a different mindset. I need to be away from everything for about a week so I can concentrate on what I am doing. A lot of it has to do with the anticipation and excitement that builds up when I prepare for a trip, but it’s a different story once I get in the field. Every time I go on a trip, I forget how much work it is once I actually get out there. I’ll think I know what I’m in for, and I have very ambitious plans, but once I get there, I forget how far I have to hike and how much weight I have to carry. It gets real very quickly. On the first couple days of a trip, I usually have to force myself to record video, and to find the subjects. Once I get over that hump on day three to six, that’s when I’m on a roll. I’ll find a subject that inspires a shot, which leads to something else, and then something else. That’s why my trips are usually about a week or so at most because after that I’m physically worn out. After about a week, I don’t care how good something is, I’m just ready to go home and look at the photos I’ve already taken.